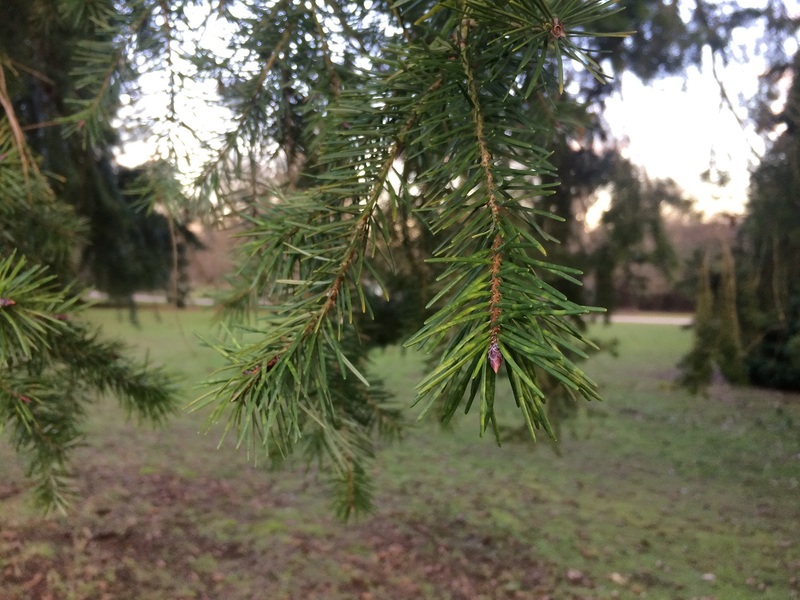 Douglas Fir is an evergreen tree in the Pine family, native of North America but widely planted in the UK. Although closely related it is not a true Fir. 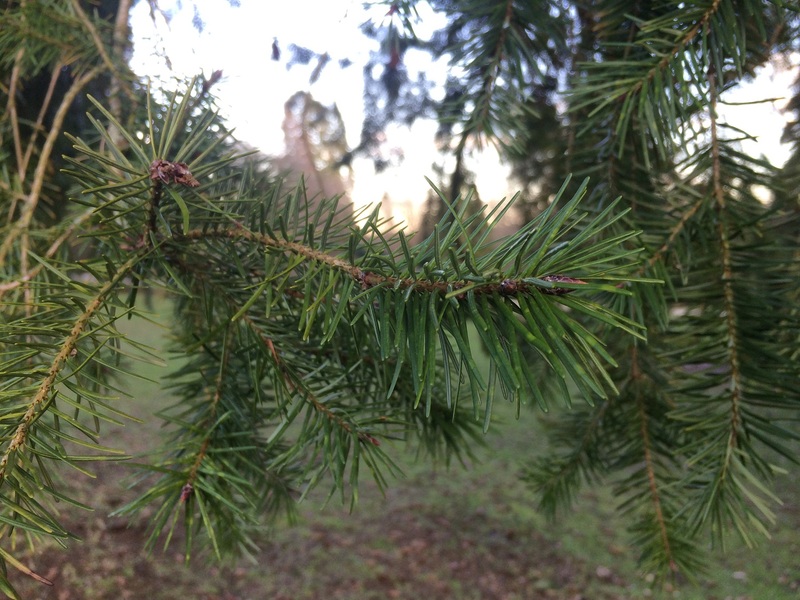 Considered the best of the edible conifers with its rich citrusy aroma, often infused into tea, syrup and spirits. The linear needles are flat, soft and blunt, 2–4 centimetres (0.8–1.6 in) long, and distributed all around the twigs like the bristles of a bottle brush. Dark green and grooved above with two white bands on the underside. When crushed the needles have a strong resinous aroma reminiscent of citrus fruits. The young new tips in Spring are lighter coloured, softer and stronger scented. 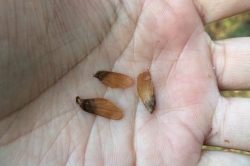 The male flowers are small pollen cones 2-3 cm (0.8-1.2 inch) long, of conical shape, yellowish, growing on the underside of the previous year’s shoots. The yellow pollen is shed in Spring, usually around May. Although very nutritious the pollen is difficult to collect in any quantity. Female flowers grow in Spring at the end of the previous year’s shoots. After being pollinated by wind the flowers develop into pendulous green cones, maturing to brown in late Autumn before falling when ripe. 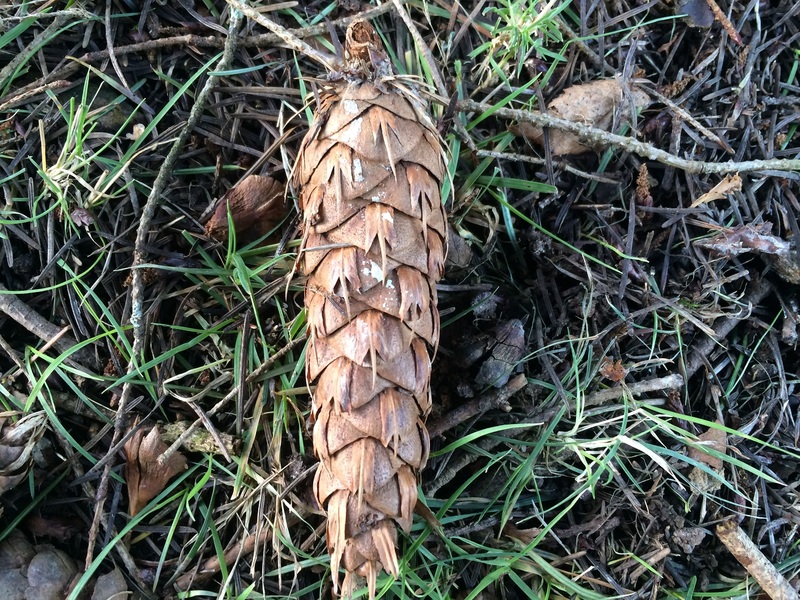 These seed cones can be up to 10 cm long and are covered in scales arranged in spiral. Between the scales emerge 3-pointed bracts that look like the lower half of a mouse (two legs and a tail). 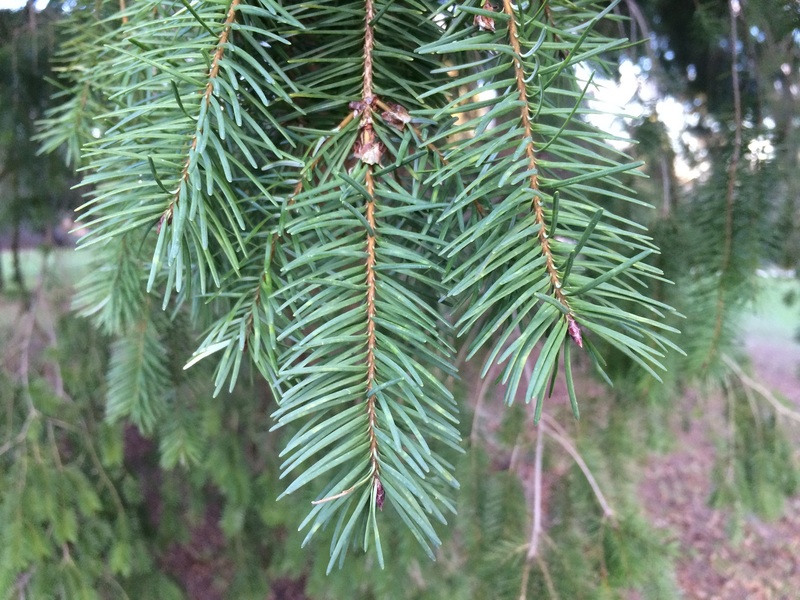 Douglas Firs are easily recognised by these “mouse tails” bracts, a unique and distinct feature. 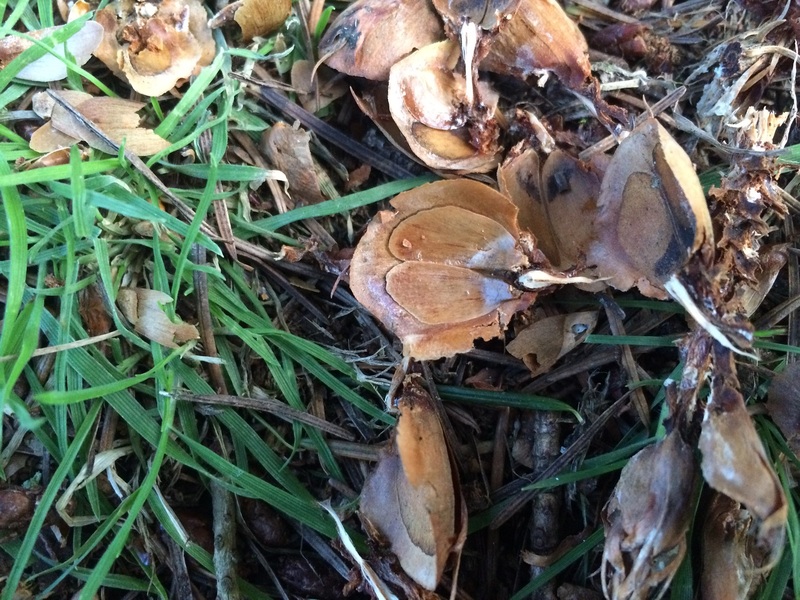 The seeds aren’t usually collected for consumption. 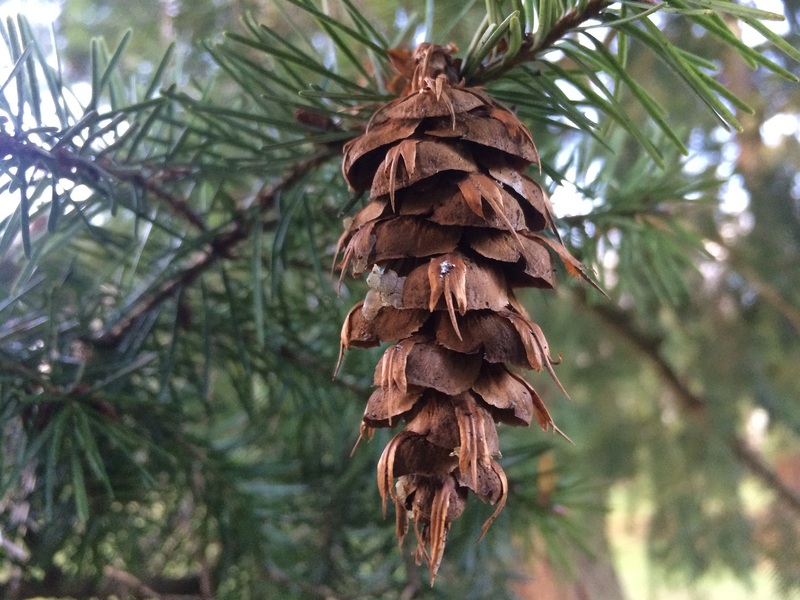 There are two winged seeds under each scale on the cones. 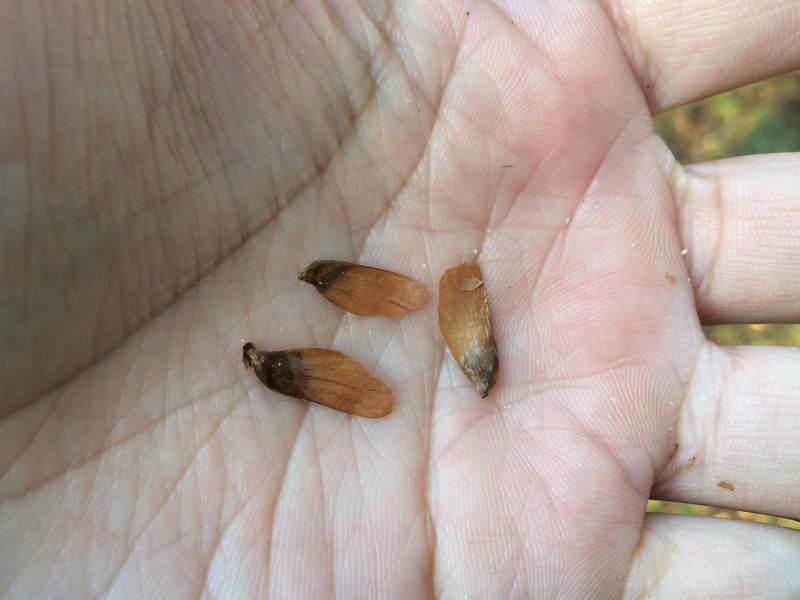 Although each seed could be up to 6mm (0.24 inch) long and 4mm (0.16 inch) broad such size is an unlikely find. These trees can take more than 200 years to reach their maximum seed production and good seed crops only occur every 5-7 years. 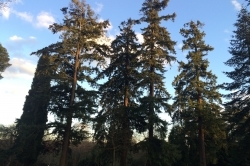 Fast growing tall tree of conical shape with a columnar trunk. 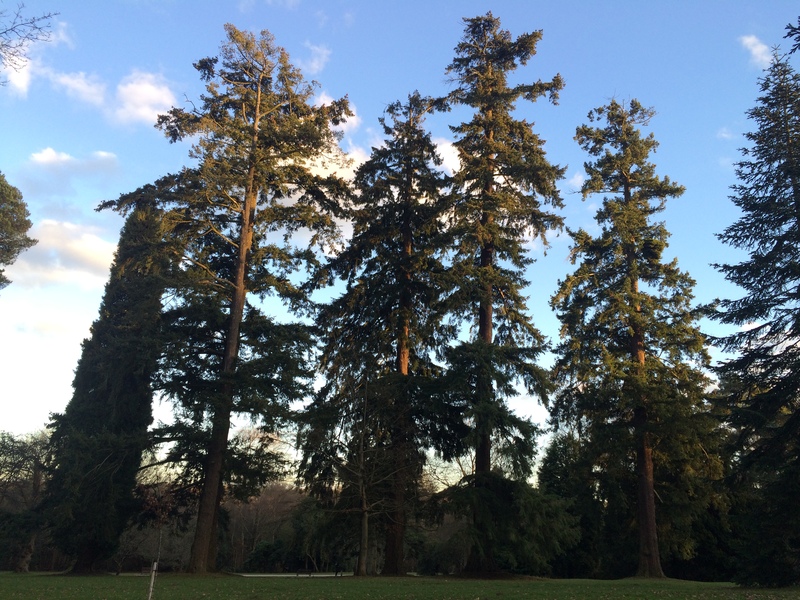 It is known to grow above 60 m (200 ft) in height and mature trees can have 1.5-2 m (5-6.5 ft) in diameter. 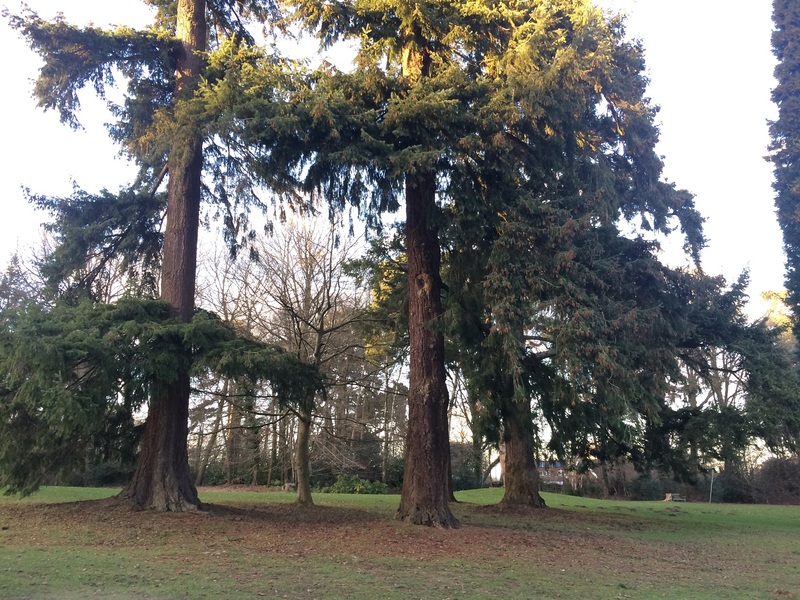 The tallest trees in the UK are Douglas Firs. 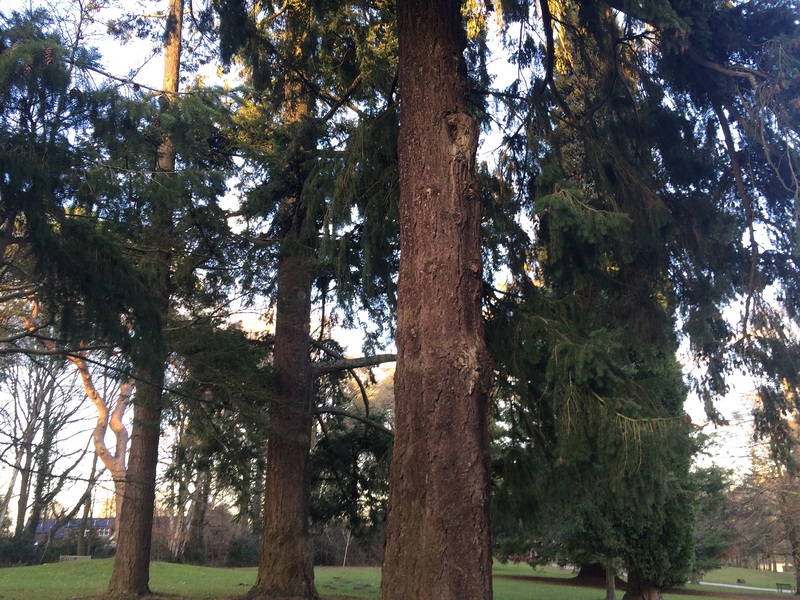 In young trees the bark is greyish-green, thin and smooth, but with numerous resin-filled blisters. 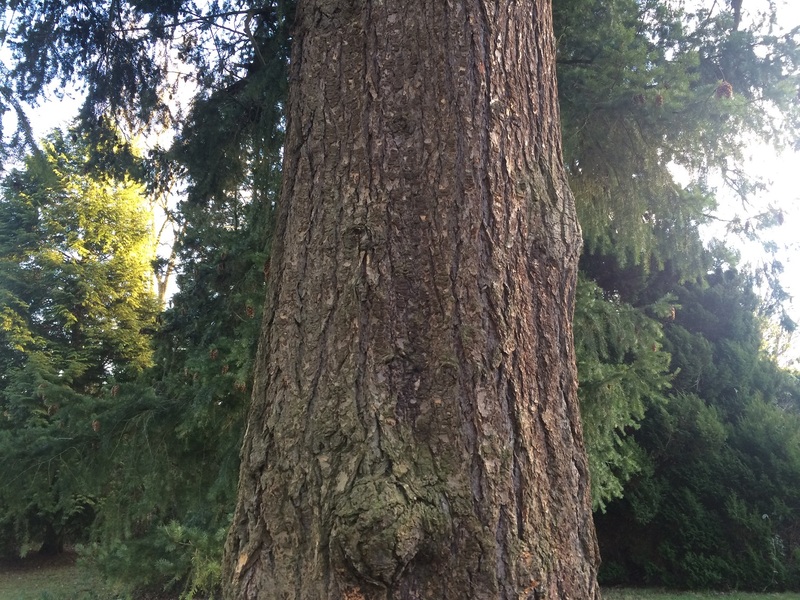 As the tree matures the bark turns to reddish-brown, thickens, and develops a ridged texture. 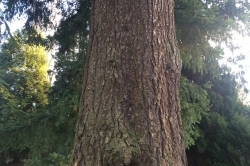 The bark is non-flammable helping the tree to resist wildfires. Douglas Fir is widely used in forestry, usually planted for its timber but also as shelter. Specimens are occasionally planted in parks and gardens for its ornamental value. 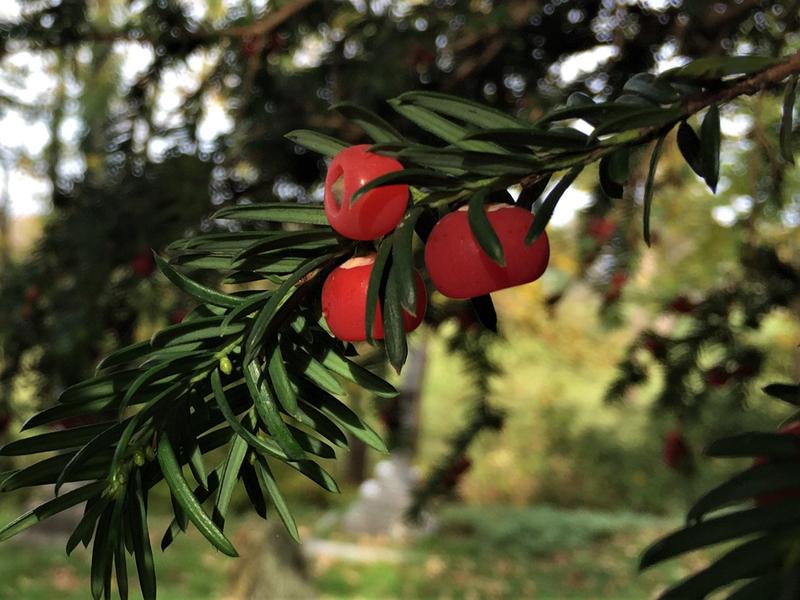 Yew – the needles of the deadly poisonous Yew look similar, but when crushed don’t have a strong pleasant scent like Douglas Fir. 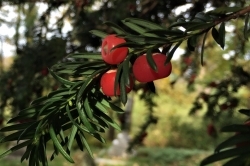 Furthermore Yew has red “berries” (arils) instead of regular cones and mature Yew trees are much shorter (up to 25m). 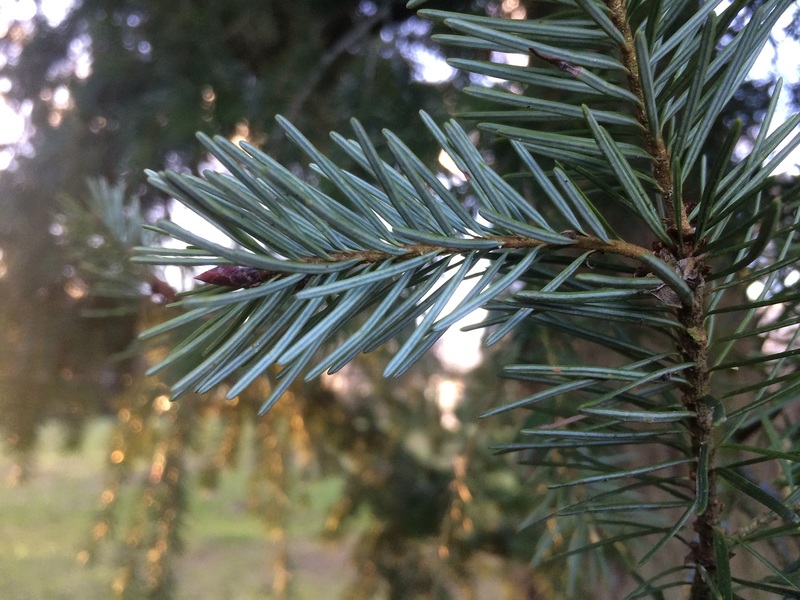 Fir – the true Firs (Abies sp.) 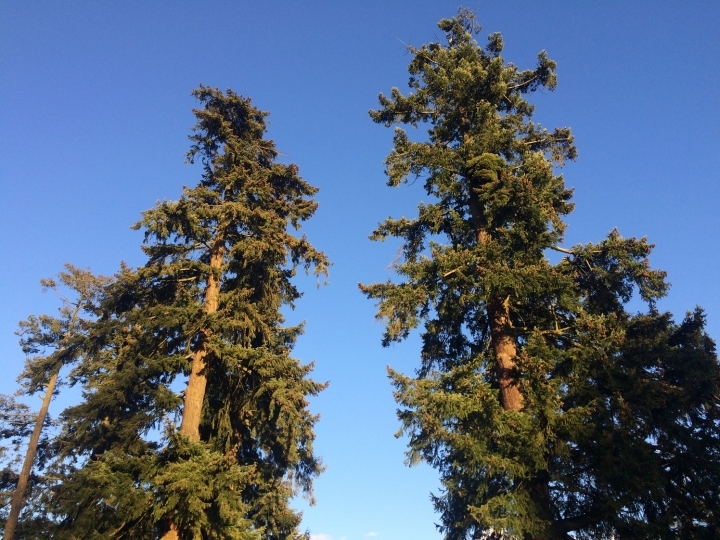 are very similar to Douglas Fir, they are also edible and can be used as a substitute to Douglas Fir. 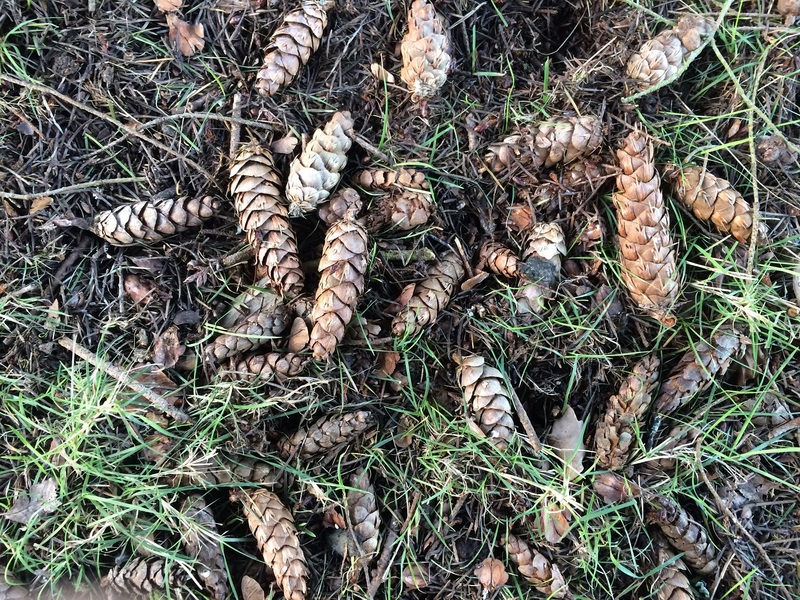 The cones of true Firs stand erect on the branches disintegrating into pieces before falling. 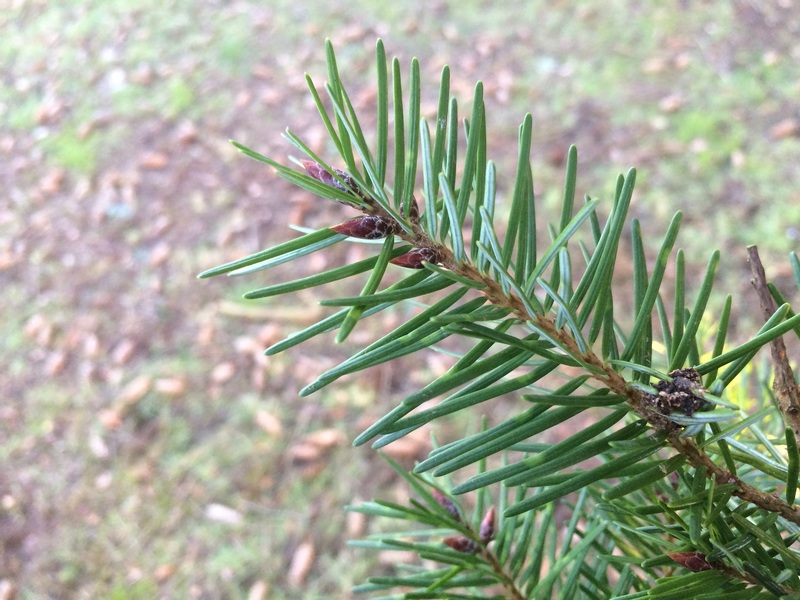 The 3-pointed bracts on the cones of Douglas Fir cones are a key identifier. 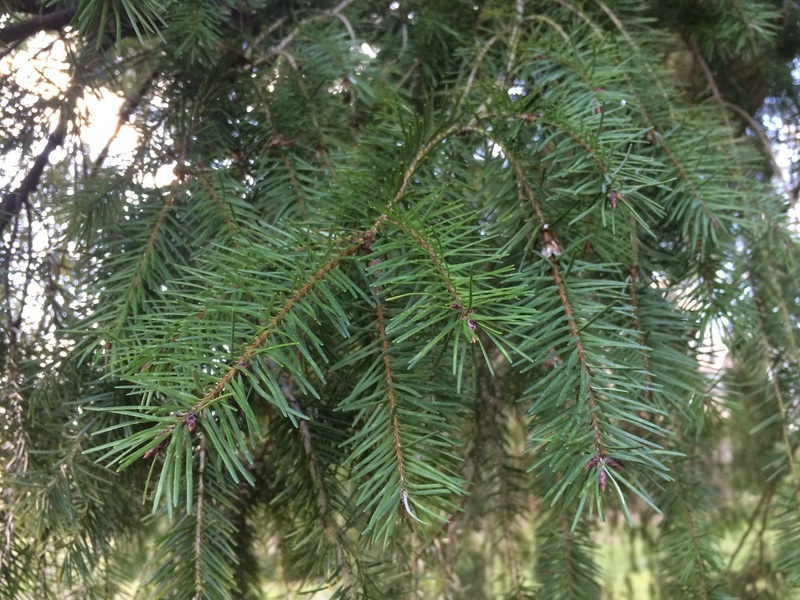 Pine – Pine trees have long thin needles that grow in groups of 2 or more. Strong resinous smell resembling citrus fruits. Occasional, mostly where planted. Widespread but more common in Western parts of the UK. 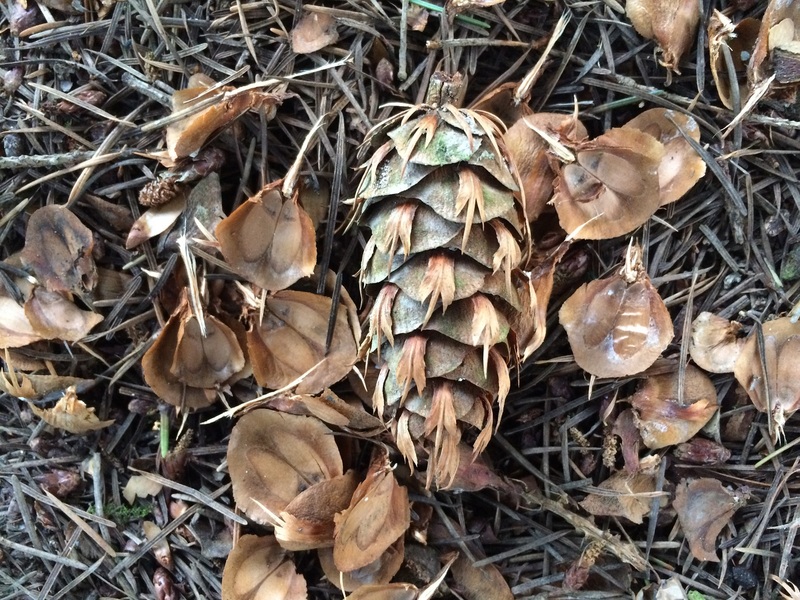 The best time to collect is in Spring when new growth of lighter colored soft tips appears. The new tips are softer and stronger scented and can be added to pesto or ferments. Young and old needles can be infused in tea, syrup, flavoured oil, vinegar and spirits. 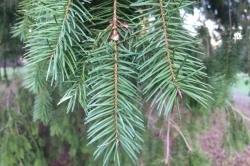 Fresh needles can be used in similar fashion to rosemary in savoury foods. Sweet uses include sorbet, soda, cocktails and baking. 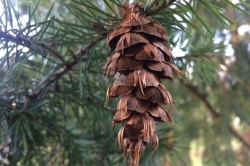 The resinous sap that appears in the green cones in Summer or forms blisters in the bark can also be collected and used. 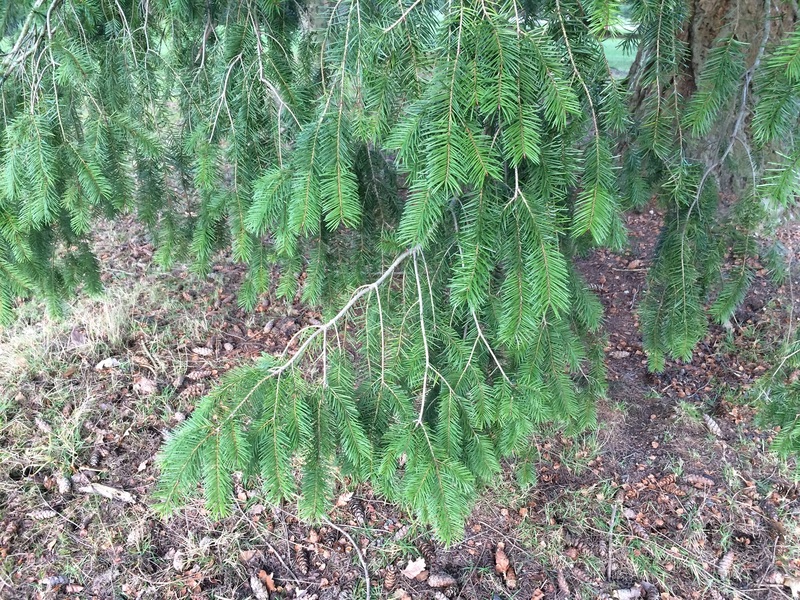 Rich in Vitamin C. The needles are used as tea to treat colds. A cold water infusion can be used as mouthwash. The resin is said to be antiseptic and used in poultices. The resin is also used to treat coughs and sore throats. The young tips can be placed inside the shoes to prevent feet odours and fungal infections. 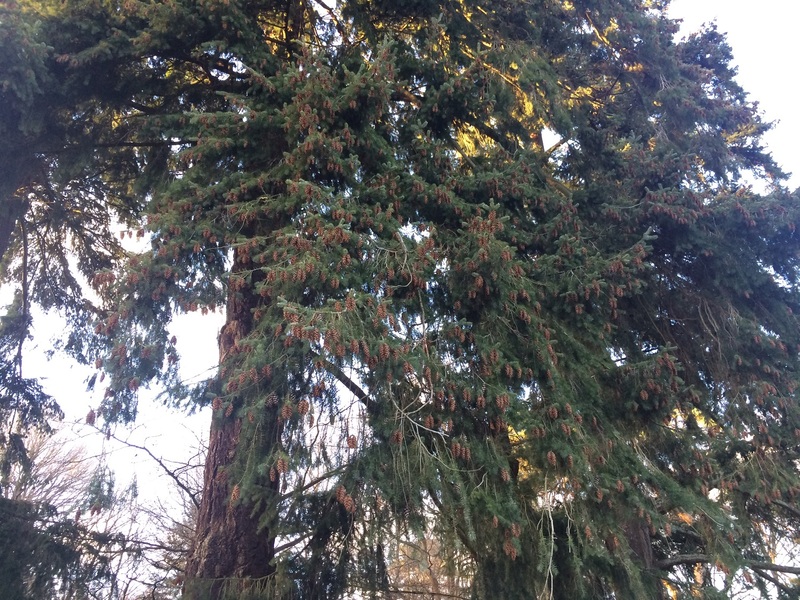 Native Americans have used different parts of this tree to treat several diseases. 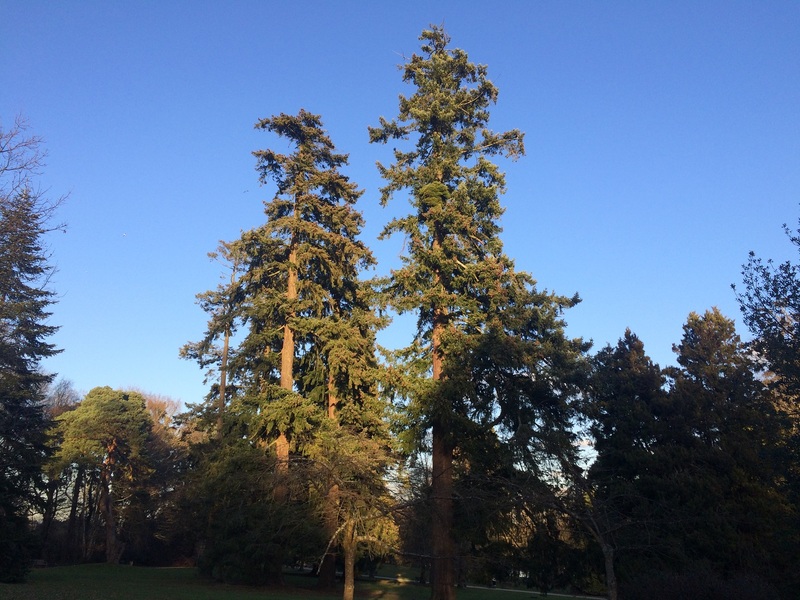 The tallest tree in the UK is a Douglas Fir recorded from the Scottish Highlands with 68m (=223ft, measured in 2017). 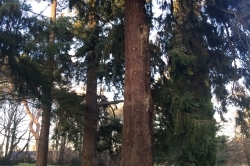 Specimens of similar size also occur in England and Wales, and it is recorded as the tallest tree in several European countries. 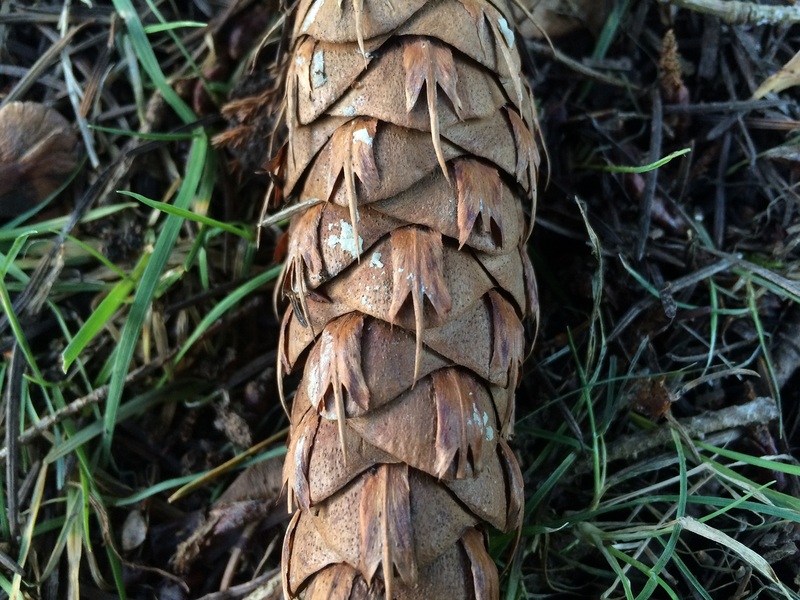 According to a Native American myth during forest fires mice would hid inside the cones of this fire resistant tree, hence the bracts between the scales. 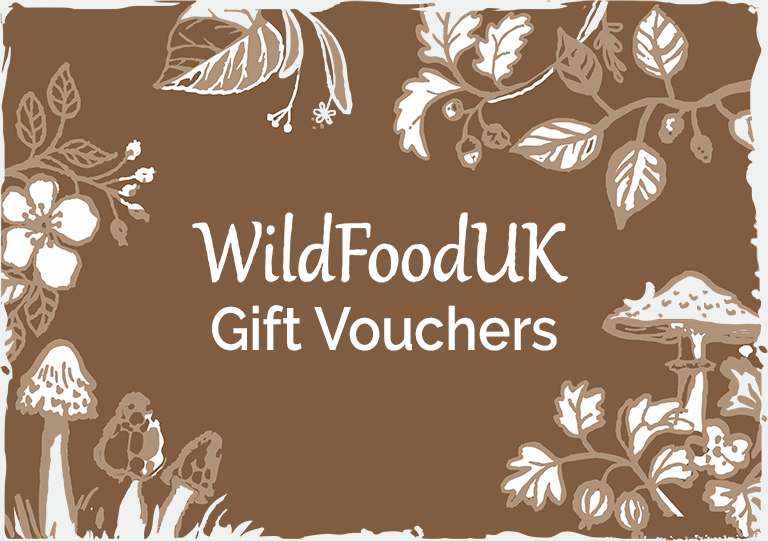 The common name derives from the Scottish botanist David Douglas who first introduced it in Europe. The scientific name however honours Archibal Menzies, another Scottish naturalist rival of David Douglas, who was the first to describe the plant from Vancouver Island.